A return to Cal Poly SLO for the career fair was quite a nostalgic experience for me, having graduated from this institution just 2 years ago. 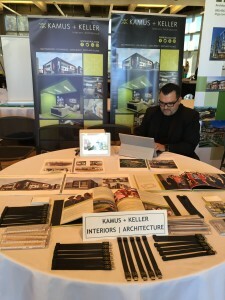 There were about 100 nationwide architectural firms at this event, all packed inside of Cal Poly’s Chumash Auditorium. 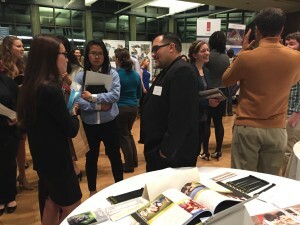 Almost every firm had a Cal Poly graduate present at the event, thus it was a great honor for me to return to my alma mater and be able to represent Kamus + Keller in front of some of the brightest and smartest students in the country, given Cal Poly’s rankings and low acceptance rate. For the very first time, out of all of the career fairs previously attended by Kamus + Keller, and even when I was a student, there was a huge increase in the turnaround of firms that were present and a very high level of creativity and competition between the firms on the different kinds of display set up, table organization, “goodies” to give out, digital screens, outfits etc. A lot of firms had brought TV screens to portray their projects; one firm had a truss system where their display boards were attached to; another one a 3D printed model etc. etc. Kamus + Keller was praised many times from other firms for their neatly organized table, and our USB drives were a successful hit with the students (and from what I remember, not available from other firms). At 5pm sharp the doors of the auditorium opened up and the students were let in. There was a huge flux of students that stormed the place, and because this was an event specifically for architecture, all of them were architecture students. Everyone was so prepared and so professional with resumes, and even business cards, at all levels of education. It was actually quite amazing that for the full duration of the event, Cory and I did not even get a chance to take a break, as there was always a line of students waiting to talk to us. Another amazing aspect was that almost all the students we spoke to had researched our website very thoroughly. Some of them could even talk about some of our projects, and there was one student who had tailored his portfolio specifically to Kamus + Keller by printing the company’s logo on his work. Students came from all levels and backgrounds. Some were seeking internships during summers, and some were graduating soon and looking for full-time positions. Almost everyone already had the impression that we were solely an interiors firm, therefore there was some initial confusion among the students as Cal Poly does not have interior design as a major. Once they saw some of the projects displayed they quickly learned that we have an architecture department that was thriving and growing, and they were pleased and interested in the work they saw (aka it was hip and it was cool for them), and they even praised the fact that as a firm we link architecture and interior design into one, as it is something that they see value in and they are being taught about in school. The most interest was shown in the Roddenberry Building, Sunset Bronson studios, Saguaro Technology, Creekside Plaza. And a bigger connection could be seen with our competition projects such as VCCU, Newbury Park Community Center, Pixel Park as these are more visionary and closer to their school projects. At the very end we were left with a huge surprise from the level of professionalism and huge number of resumes with some great candidates for the future of Kamus + Keller. Jump over to our Portfolio page for a glimpse of some of Kamus + Keller’s innovative architecture projects.